I was there yesterday - the first day of the 3-day Sony Ericsson 3D Expo (November 11-13) at Sony Ericsson SM Cebu Cyberzone for the Launching of the new Sony Ericsson Android Phones in XPERIA lineup. The new Sony Ericsson Android Phone Xperia are Xperia Ray, Xperia Active and the newly launched and the first Sony Playstation-certified smartphone Xperia PLAY. Visit Sony Ericsson 3D Expo at SM Cebu Cyberzone now an be treated to Xperia product demonstrations, mobile games, the 3D imaging and viewing experience and the sound technology of Sony xLOUD audio. The Sony Ericsson Xperia active is for users with a fit and active lifestyle, being dust-proof, scratch-resistant and water resistant (20 mins soak). The Xperia active allows wet finger tracking, ensuring great performance even when the phone or the user’s fingers are wet. Sports apps such as iMapMyFitness plus built-in GPS, barometer and compass functionality are built-in with Xperia Active. With a 3-inch screen and running the latest Android platform for smartphones (Gingerbread 2.3), Plus the Mobile BRAVIA Engine enables Reality Display, a 5-megapixel camera with HD video functionality, and a 1Ghz processor.The first handset together with Xperia Ray in the Philippines featuring 3D Sweep Panorama technology from Sony Cyber-shot. The Sony Ericsson Xperia Ray - The one of the Xperia smartphones with 3D image capture, has a side profile of only 9.4mm and a 3.3-inch touchscreen. The Xperia Ray’s body is based on a genuine aluminum frame, evident on each side of the display. 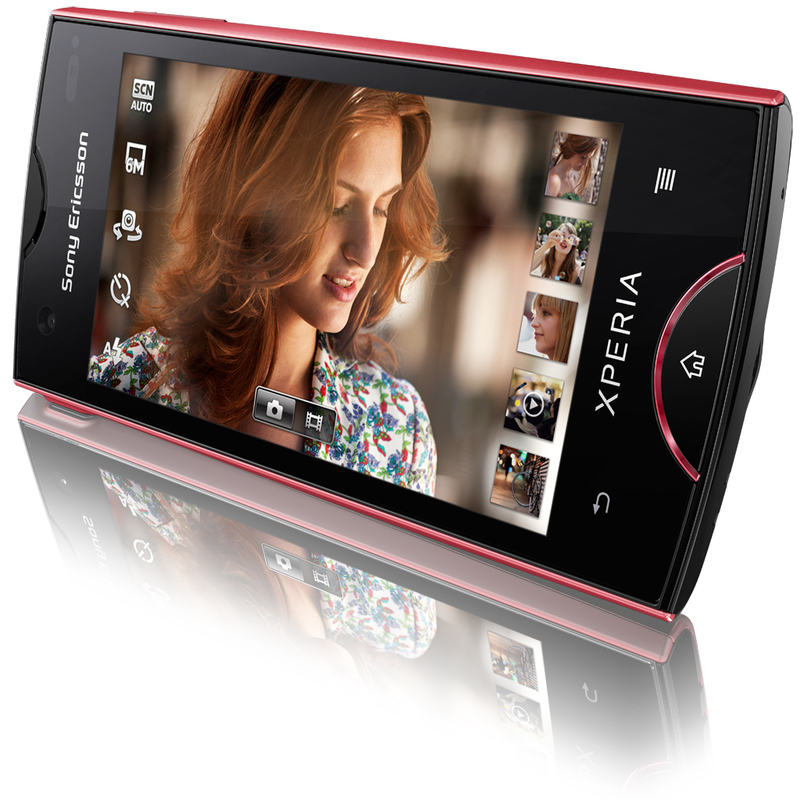 Xperia Rays's front face is made of clear black scratch resistant glass with integrated touch keys. An 8.1-megapixel camera with Exmor R for mobile and the Reality Display with Mobile BRAVIA Engine and a front-facing camera are perfect for self-portraits and video chats. The Xperia ray also has a battery life similar in size to larger smartphones. The Sony Ericsson Xperia Active Android Phone soak in water test. 3D Sweep Panorama is a camera shooting mode where users can capture a scene in true 3D with a sweep of the camera. Users just pan the camera and up to 100 images are automatically taken from a number of different angles. The camera’s processor then analyzes and combines these images to build the full 3D picture, which can be viewed as a fully three dimensional panoramic image on a compatible 3D TV. 3D Sweep Panorama will also be available in current Xperia handset models such as Xperia mini, Xperia mini pro and the Xperia arc via a software upgrade and in upcoming models such as Xperia neo V, Xperia pro and Xperia arc S.
This is Sony Ericsson Walkman's ace feature - for better audio, the new line of Xperia smartphones offer Sony’s xLOUD audio technology which enhances and improves volume in the loudspeaker during playback. 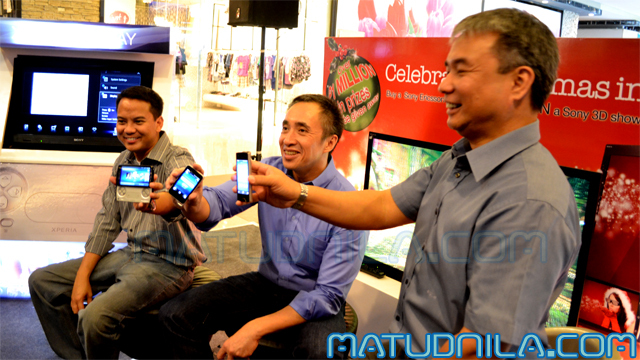 Sony Ericsson's (L-R): Vince Dela Cruz, Product Manager; Patrick Larraga, Marketing Manager & Dennis Manzano, Sony Ericsson Philippines General Manager. 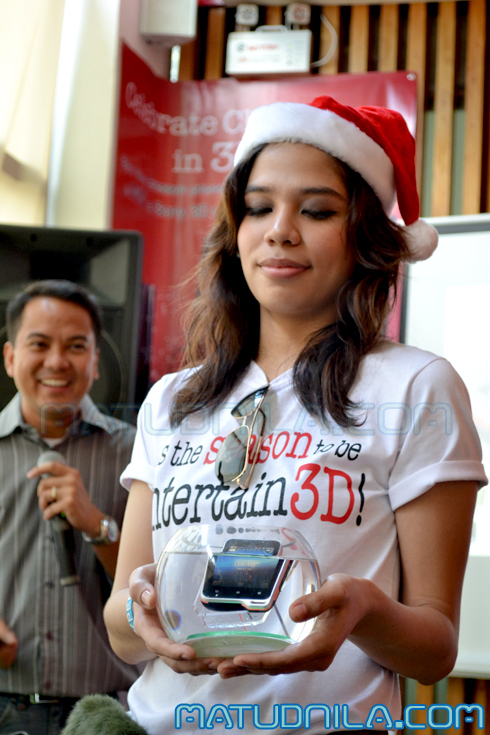 Sony Ericsson’s Christmas in 3D Promo. 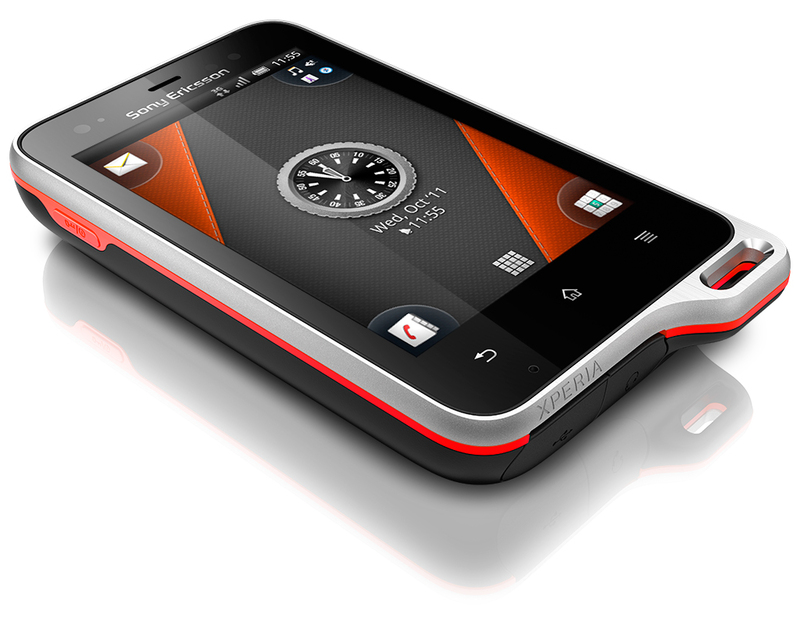 Sony Ericsson Xperia™ arc smartphone. 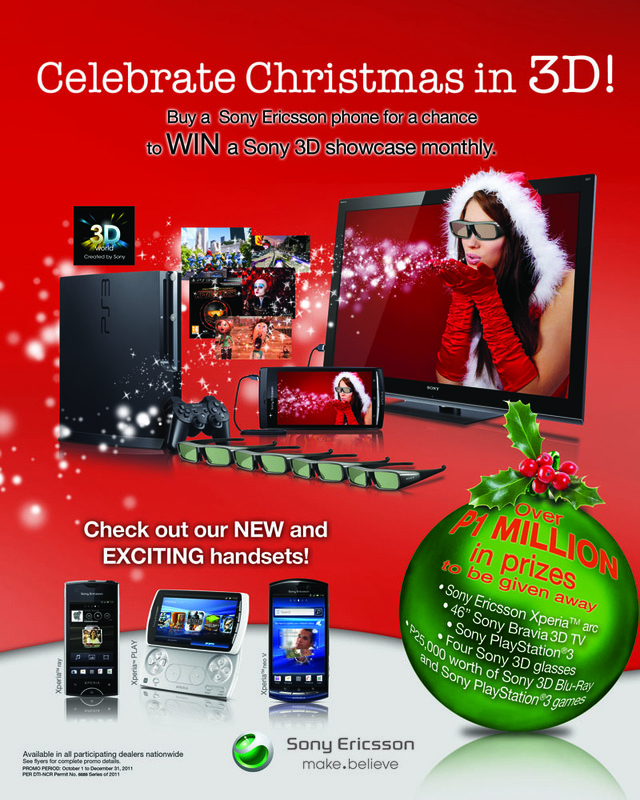 For Sony Cyber-shot 3D camera technology best experience, Sony Ericsson brings the Christmas in 3D promo. 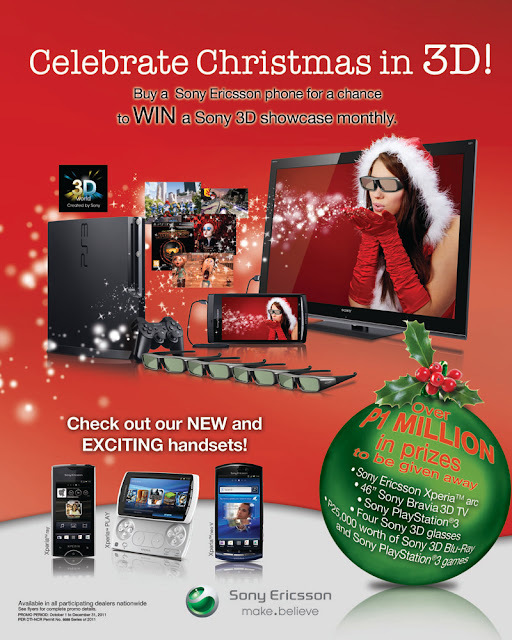 Buyers of Sony Ericsson handsets from concept shops and participating dealers from now until December 31, 2011 will have a chance to win over P1 million worth of prizes in three Sony 3D showcases. They will get a number of raffle tickets depending on their purchased handset model. Purchase of the Xperia arc, Xperia ray, Xperia PLAY, Xperia neo V, Xperia pro and Xperia arc S entitles the buyer to as much as three raffle tickets.Visit the Sony Ericsson Concept Shops now. ALso, join the Sony Ericsson Philippines on Facebook at www.facebook.com/sonyericsson.ph. 0 comments: on "Sony Ericsson new Android Phones Xperia Active and Xperia Ray"